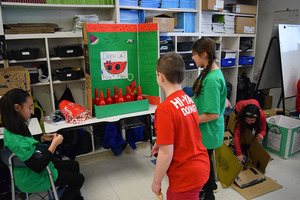 A hum of animated chatter and laughter filled Frank LaMorte’s classroom last Friday as students excitedly bounced from station to station playing homemade, arcade-style games designed by their peers. 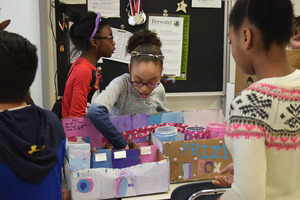 For the sixth consecutive year, LaMorte, along with Michelle Marzziotti and Kathryn Marchionno, hosted Caine’s Arcade: an event that requires their students to create games from recyclable materials found around their homes. Then, the entire school is invited to come and test out the student-made games. According to LaMorte, the event started after teachers throughout Brewster Central School District received an email from then-Superintendent Jane Sandbank. The email contained a video called Caine’s Arcade, which was about a nine-year-old California boy who spent a summer making a cardboard arcade in his dad’s used auto parts store. LaMorte was inspired by what he saw and CV Starr’s Caine’s Arcade event was started. 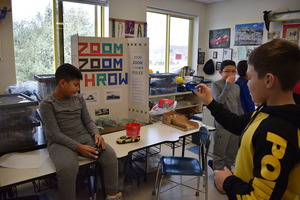 LaMorte’s enthusiasm for the event is contagious, as is evident by the excitement students displayed as they explained their games to their peers or played game after game made by other students. There was a game called Hungry, Hungry Kitty, which was like Skee Ball but required players to throw a fish into a cardboard cat’s mouth. There was Doro Cat, an elaborately decorated ring toss game named after its creators’ special nicknames. The girls who created it even wore special Doro Cat t-shirts with “STAFF” printed on the back. There were basketball games, a ball drop game, a game that involved throwing balls into a remote-controlled car, and even a claw game. Interaction with their peers definitely seemed to be one of the highlights for students. Ella Zambraski, who created a claw game with a few of her friends really enjoyed herself too. “My favorite part is seeing kids with smiles on their faces after they win,” Zambraski said.